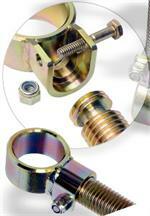 Swivel Eye unbolts so you can make quick sway bar changes. It also keeps your sway bar from binding. 1-1/2" Swivel Eye and Threaded Stem (11970), 2-1/8" Swivel Eye and Threaded Stem (11975).